Yesterday, you might have seen some tweets announcing the release day of one of our most highly anticipated new books, Inclusion in Action by Nicole Eredics. If you placed an order after seeing one of these tweets, you might have been confused by the book’s status on the Brookes Publishing website (which stated it was not yet available) and Amazon (which stated that it was temporarily out of stock). We’d like to take a few minutes to communicate what happened and update you on the status of this amazing new book. We’ve investigated the situation here at Brookes, and it looks like a release date of 4/2 was entered into our data management system instead of 4/20, the actual projected release date. Because Amazon gets its information from our system, an incorrect date was posted. We’re so sorry for the confusion this has caused, both for our customers and for Nicole Eredics, an author we’re absolutely thrilled to be working with. So what’s the status of the book? 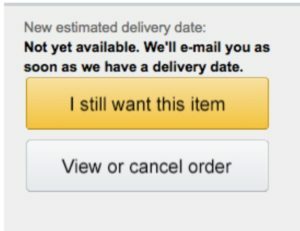 I received an email from Amazon asking if I want to cancel my order. What’s going on? Assuming you still want the book, please go ahead and click “I still want this item” so Amazon doesn’t cancel your order. Your book will be shipped to you once Amazon receives the books from our warehouse later this month. What will you do to be sure this doesn’t happen again? We will immediately put a stronger system in place to be sure that the release dates displaying on Amazon consistently match our projected release dates. Double-checks will be instituted so that our customers and authors always have the correct information about release days. To everyone who ordered the book: Thanks so much for being patient while we investigated the situation, got the facts straight, and confirmed the status of the books. We’re extremely sorry for the confusion and inconvenience, but we’re confident Inclusion in Action is 100% worth the extra (short) wait. In the meantime, we want to make the whole month of April a release day celebration for Nicole and her book! Next week, we’ll be running a Q&A with her right here on the Inclusion Lab, where she’ll talk more about Inclusion in Action and the process of creating an inclusive classroom culture. We’ll be sharing quote graphics on social media with some of our favorite quotes from the book. And stay tuned for special prize pack giveaways later this month, during the official release week celebration! Thanks so much for your patience and understanding, and for ordering Nicole’s awesome and practical inclusion guide.